If you’re planning to purchase one of Canon’s two new DSLR cameras, you might want to set aside some extra cash for a larger memory card. The recently announced Canon EOS 5DS and 5DS R both feature 50.6-megapixel sensors that provide more resolution than any other full-frame DSLR in the world (a distinction previously enjoyed by Nikon’s D810 at 36.3-megapixels). As additions to Canon’s 5D line, both cameras look and feel very similar to the popular 5D Mark III which isn’t necessarily a bad thing. Each employ dual DIGIC 6 image processors for speedy image processing when needed and both use a 61-point autofocus system. Other minor improvements include the reinforcement of the chassis, baseplate and tripod plug as well as a redesigned mirror vibration control system – all to help stabilize the sensor. You also get some new auto white balance options as well as a few cropped shooting modes (30.5-megapixel and 19.6-megapixel) if for some reason, you don’t want to take advantage of the entire sensor. Data transfer thankfully takes place across a speedy USB 3.0 interface. Naturally, there are a few drawbacks when shooting at such a high resolution. For starters, continuous shooting is limited to just five frames per second and the ISO maxes out at 6,400. It’s also not going to be an ideal choice for videographers due primarily to the lack of HDMI-out and a headphone port. 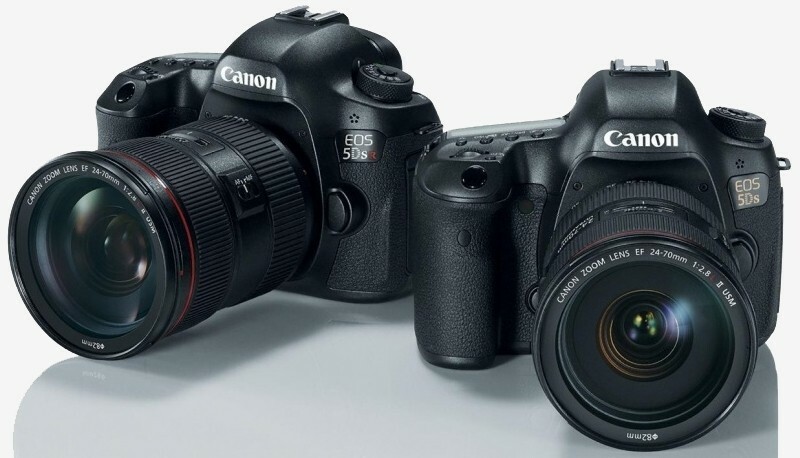 The main difference between the 5DS and the 5DS R is the fact that the latter can cancel out its low-pass filter in order to deliver sharper images. The cameras (body only) will go on sale in June for $3,699 and $3,899 for the 5DS and 5DS R, respectively.